Mazda Mazda6 Quietness Pros and Cons | Page 1 of 1 | Why Not This Car? NVH (noise, vibration, and harshness) used to be a Mazda weakness. The Protege5 I owned from 2003 through 2014 was a LOUD, rough car. While it's crudeness was part of its charm, it didn't make for a relaxing drive. It was loud. It was always loud. What is there to say? At least it had a great stereo. Though neither car is loud inside, you'll experience significantly more road noise in both the Volkswagen and the Mazda than in a Chevrolet Malibu or Ford Fusion. 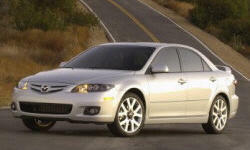 Mazda didn't attempt the hushed interior of a luxury sedan, and the 2014 Mazda6 doesn't include one. Around town noise levels remain far from loud. But at highway speeds the interior grows borderline noisy, especially on concrete. Not a quite car and a bit draining on a long trip but to me at least mot intolerable at all. There is a fair amount of road noise, tire choice can go a long way to counter it. Think Honda rather than Lexus. I dislike the quietness of the exhaust note, it is simply not there. A little engine growl would go a long way to adding some character. Lot of road noise in the hatchback version, especially on uneven pavement. Also, 5th gear is a little short, so the engine sounds a little buzzy on the highway. Sporty feel/drive leaves too much noise. Ok when I was 20& stero was cranked. Now not so much. Wind noise is apparent. Tire noise is obvious on concrete highways but not on asphalt. The engine is extremely quiet, and combined with the 6-speed transmission, it makes for extremely quiet freeway cruising. The gearing of the transmission makes the car engine buzzy and loud when cruising on the highway. Under hard acceleration it is positively raucous. Its a triffle noisy compared to other sedans of comparable class, but its not bad. Very noisy, especially at highway speed. Wind noise is very loud.